… which is apparently the primary resource on Hethert-Nut. So I’ve ordered a book by Erik Hornung which should have a solid chunk of information about it. 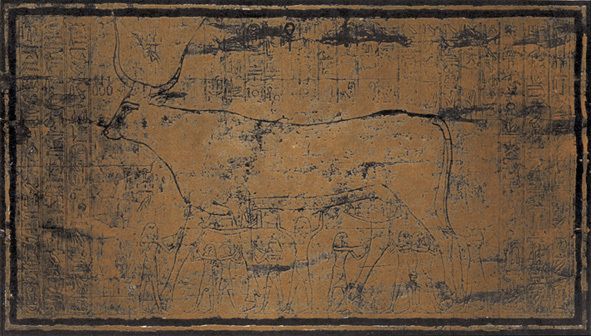 This spell is to be recited over the (picture of) a cow, with “the Infinite Ones who are” (inscribed) on her chest, and over whose back is (inscribed) “the Infinite Ones who are”. Whose four hoofs are filled out in paint and upon whose belly are nine stars, issuing from its hindquarters in front of its hind legs, while beneath its belly stands Shu, painted in yellow ocher, his arms support these stars, and inscribed with his name between them, which says “Shu is himself”. A magician, his head being purified, should make a female figure, standing to his South, and draw a goddess upon her, and in the middle of her, a snake standing erect upon its tail, with her hand upon its body and its tail upon the ground. Oh oh, actual translations here!